Look how little my peanut was! 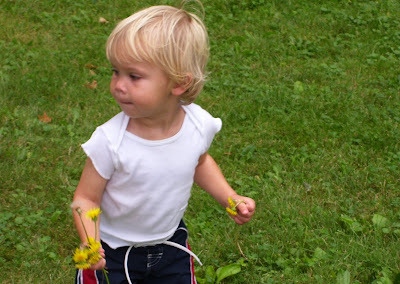 And he STILL collects bouquets of dandelions! Gorgeous. And so blond! Is he still that blond? Wow he's so adorable!!! He looks os happy! Ann, a little darker blond now. Not sure where he got it from either! so adorable! i am learning time passes by way too quickly. He's such a cutie! Time goes by way too fast, doesn't it? Oh, I miss that age. I'd take a bouquet of dandelions over roses any day! He's so cute. I'd die for that shade of blond hair! Lovely. Cute, cute, cute! What an adorable age. Look at that golden hair! What a cute little peanut! I came over here from Jen's blog and I'm glad I did! My boys are convinced that if it had petals, they should make bouquets for me. So sweet! How cute! We're going to Cafe de Monde on Friday so I'll be able to tell you how it matches up! Ahh...how sweet. What a little cutie! He reminds me of my 21 year old who is now in the Marines. He was a blondie just like that...Sweet sweet! Isn't it amazing how fast they grow?? What a cutie. 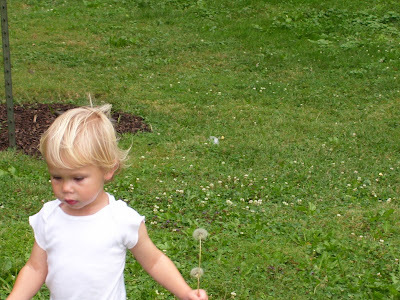 I am glad he still collects dandelions for you. Cutie pie out having fun. Omg, the cuteness!! Your peanut is 150% too cute, congrats!! Aww what a cutie! 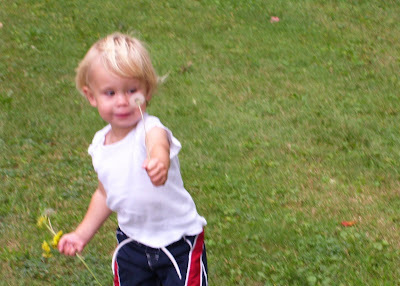 When my son started playing T-Ball (He was 4) he would stand in the outfield and pick flowers for me lol. You can imagine how much his Dad didn't like that...but I loved it! Your peanut is beautiful. What great pictures!